"Win Scholarships at School of Art. Oberlin Girl and 2 Lakewood Boys Get European Awards"
"The Plain Dealer" newspaper article announcing the winners of scholarships at the Cleveland School Of Art. 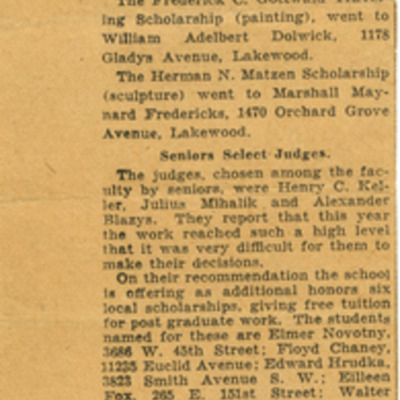 The Herman N. Matzen Scholarship (Sculpture) went to Marshall Maynard Fredericks, 1470 Orchard Grove Avenue, Lakewood, Ohio.